Independent lens maker Sigma won plaudits for the optical qualities and accessible pricing of its high-speed 35mm and 50mm f1.4 DG HSM Art full-frame models, and now the Japan-based manufacturer has added a highly-anticipated ultra-wide model to the range. 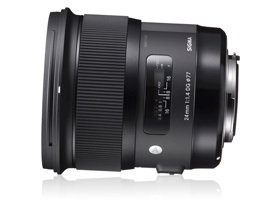 Externally, the 24mm f1.4 DG HSM A resembles its siblings, with a matte finish exterior and finely-ribbed focusing ring. It is a big lens, too, with a 77mm filter thread and 15 elements in 11 groups, three of those from FLD glass that’s said to possess similar optical characteristics to fluorite, and a further three made from conventional low-dispersion glass. Sigma has also incorporated two aspherical lenses in the design to further minimize aberrations, particularly coma, spherical aberration, and distortion. As with the other lenses in the range, this model features a sonic-type HSM motor and 9-bladed diaphragm with a circular opening for improved rendering of point light sources, particularly at large apertures. This premium model weighs in at a not so dainty 1.46 lbs (665g) and is available for Canon, Sigma and Nikon mounts at around $849. 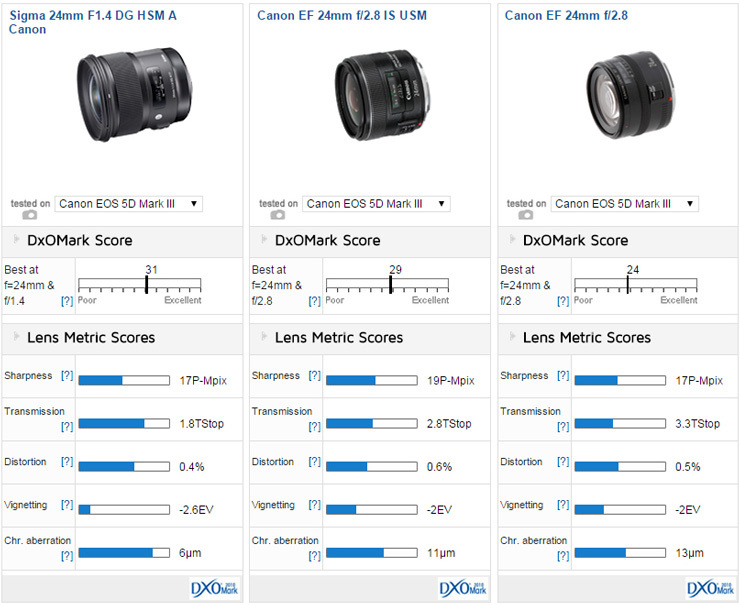 The new Sigma 24mm achieved an overall DxOMark lens score of 31 points on the 22-Mpix Canon EOS 5D Mk III — a high score overall, and as a benchmarking exercise, it ranks alongside competitive models. Although that’s a surprise at first look, given the performance of the 35mm and 50mm models, it is possible that some subtle differences among the models may become apparent on a higher-resolution body. It will be intriguing to see how this lens performs on the 50-Mpix Canon EOS 5Ds models, and particularly against the new Canon EF 11-24mm f4L. The Sigma is the joint best-performing model for the same focal length, and it comes in joint second place (after the Canon EF 35mm f2 IS USM at 33 points) in the wide-angle category. As always, though, it’s worth looking carefully at the measurement data to see exactly how this model performs relative to competing models. Compared to the highly regarded (and fairly recently updated) Canon EF 24mm f1.4L II USM, the Sigma can’t quite match that model’s peak sharpness, which was achieved at f4-5.6 centrally, although the Sigma also has both better uniformity and sharpness in the outer field at those apertures. 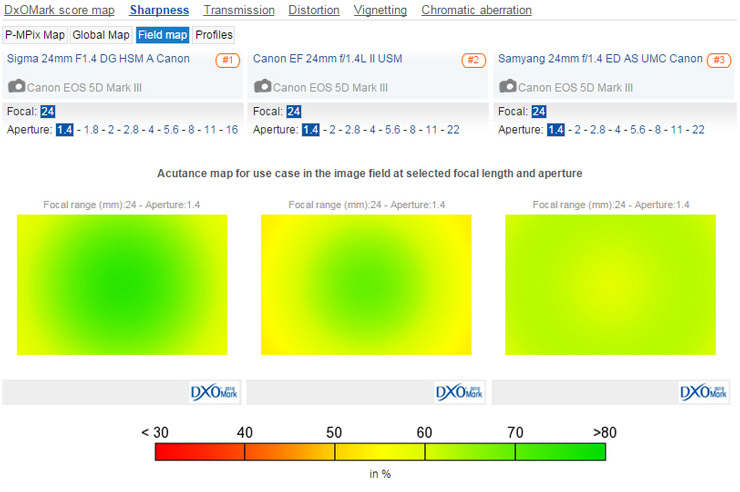 Both have field curvature, but the Sigma outperforms the Canon in sharpness and lateral chromatic aberration at maximum aperture and at f2.0 by some margin, although the differences are less pronounced at the periphery. In contrast to those models, the manual focus Samyang doesn’t perform that well centrally when wide-open, but improves greatly at f2.0, even if it never quite matches the performance of the Sigma and Canon at any aperture. It also has rather high levels of distortion. 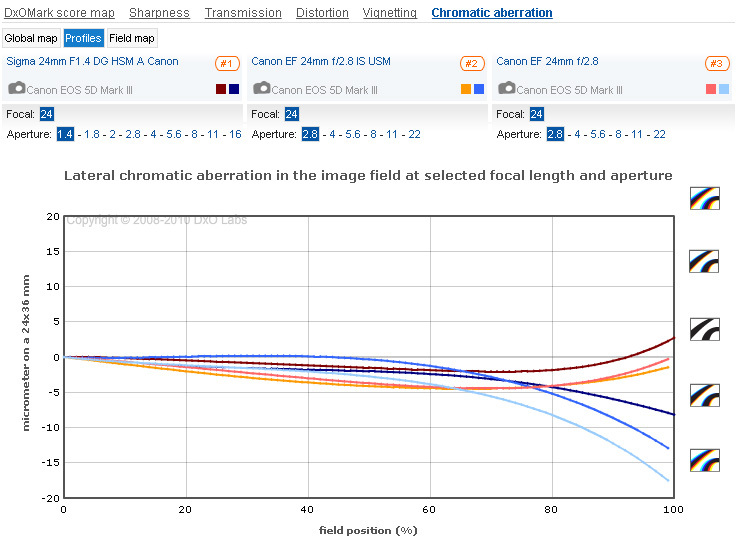 At f2.8, the performance of the two AF models is close, although the Canon has just a slight advantage in the outer field. The excellent wide-open performance of the Sigma is bettered only by the pricier Canon on stopping down, and even then only in the center. The Sigma is notable for its uniformity. The Sigma also has excellent control of CA across the field wide-open, but particularly in the center, aiding both acuity and resolution. 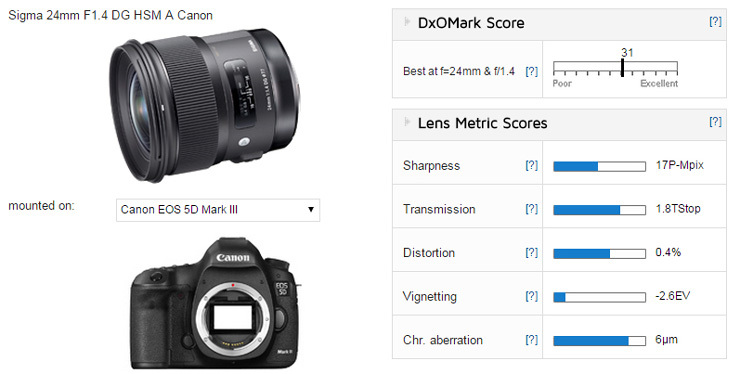 The Sigma outperforms Canon’s less expensive (but still only $50 or so less than the Sigma) moderate-speed offering. There’s no escaping that the Canon is an excellent performer, but that lens has nothing like the challenges faced by the Sigma design team. 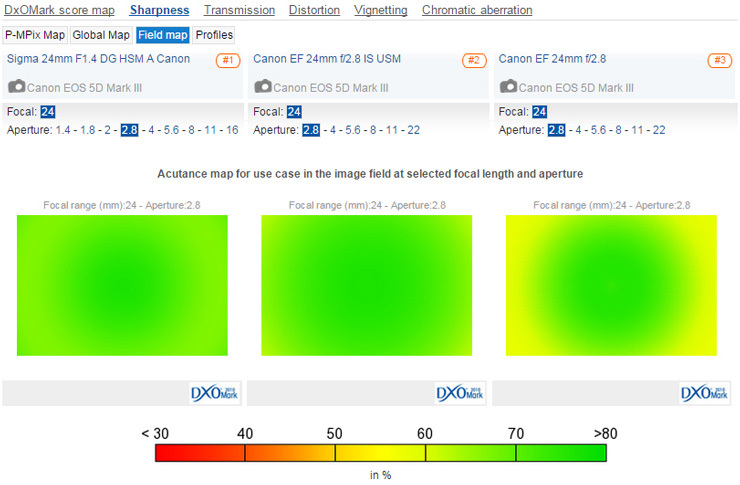 Although like its pricey sibling, the stabilized Canon offers slightly higher peak sharpness, in this instance in a small central core at f4, overall the Sigma has more uniform sharpness across the field. The independent lens can also boast much lower chromatic aberration at the initial aperture, and lower distortion as well. Both models outperform the original and more affordable EF 24mm f2.8 (even if it can still be found on dealers’ shelves), but then that’s hardly surprising, given it was designed for film way back in the late 80s. The Sigma doesn’t quite match the stabilized Canon at its initial aperture for peak sharpness, but it has superior uniformity throughout the aperture range. Another look at the Sigma’s impressive control of lateral CA: it is lower across the field at the initial aperture of f1.4 than the Canon models at f2.8. 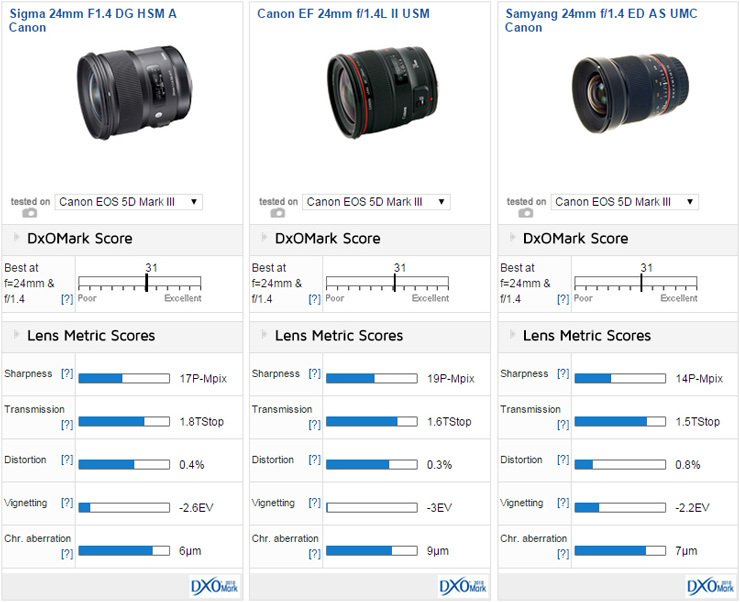 Although at first sight the Sigma’s overall DxOMark score might not look as convincing as the two previous Art models from the maker, it is important to look deeper than the numbers suggest, especially at shorter focal lengths. The Sigma 24mm f1.4 DG HSM is the finest 24mm we’ve seen, although against the Canon 24mm f1.4L II USM, it’s a close-run thing. 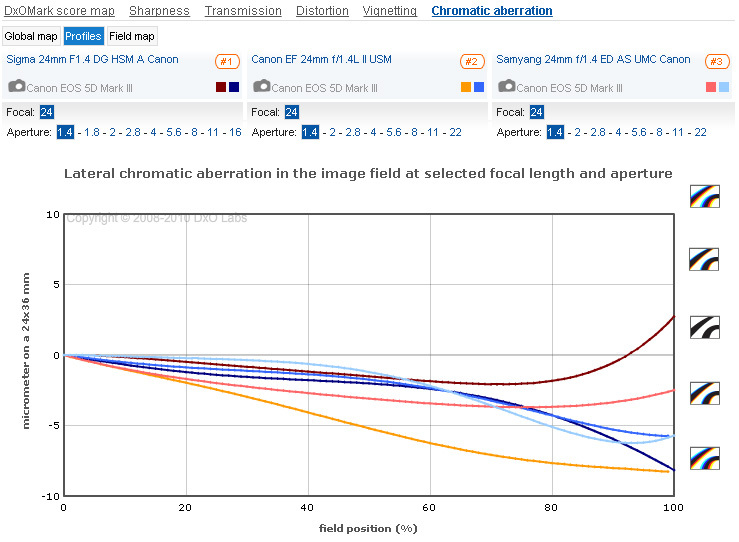 That model has slightly higher peak sharpness centrally at f4-5.6, but the Sigma has more uniform performance overall, including superior control of CA and distortion. It’s a worthy addition to the range and will only add to the maker’s reputation. 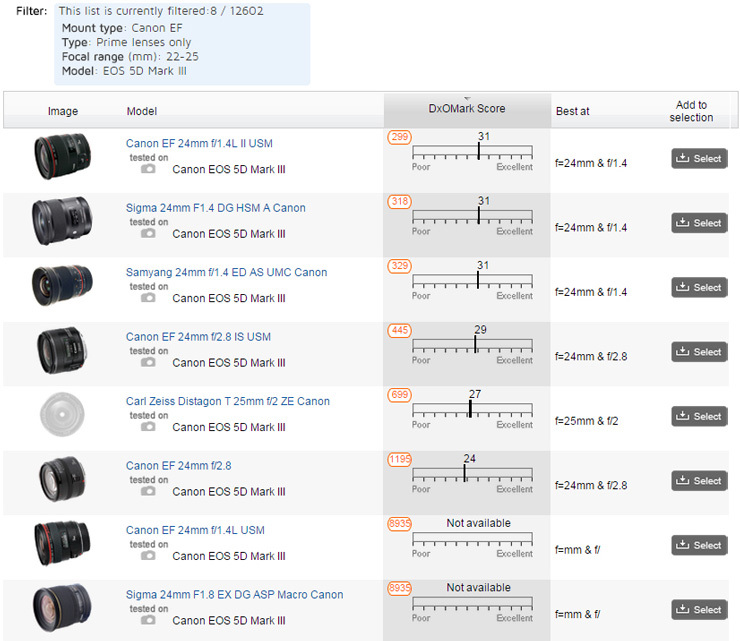 Plus at around half the price of the Canon L-series equivalent, it’s a steal.